Starting end of this week, we can scan bits of Finnish design in a pop-up store in the Museum of Arts and Design (MAD) foyer. The event is taking place soon, in 21-28 of October… Another great chance to get a glimpse to the 2012 World Design Capital…Helsinki and the surroundings. New York is promoting the uniqueness of Finnish design, as 2012 promises to be creating something extraordinary out of the concept thinking that is so true to contemporary design. The materials and products are connecting to the sustainable values, which global north now represents. ‘Arctic design’ is a concept, which will add dimension to Scandinavian design parameters and tradition. Finland’s architectural roots will be visible in Helsinki, so looking back in history is important. What is creating the contemporary presence, yet, is the remaking of the tradition. When looking back in the history of Finnish design, Alvar Aalto (among others) was not only an architect. His Aalto-vases have become well-known products around the world. His glasswork and furniture appear still in North American museums (MoMA, Philadelphia Museum of Art)… The conceptual thinking of adding different ingredients in the pot and then seeing and tasting what is the flavor of the ‘end-product’ describes today’s designs. Urban settings, architecture, city panning, environment, green values, greeneries, food-cultures, music, technologies, and so on, define what has value as a design. What still remains important is the craft and tradition to the content. As Philadelphia Museum of Art was exhibiting Finnish design classics among its contemporary design exhibition in the summer, Caroline Tiger wrote for The Inquirer (in May 20, 2011: “Philadelphia Museum of Art to open major contemporary design exhibition”): “Although the Philadelphia Museum of Art’s modern design collection has grown to be the biggest and best-regarded of any general museum in the country, it has lived mostly under the radar” . Saying that this ‘low profile’ exhibition in the Perelman building’s modern design gallery showed several interesting pieces from Finnish design masters, is quite modest. 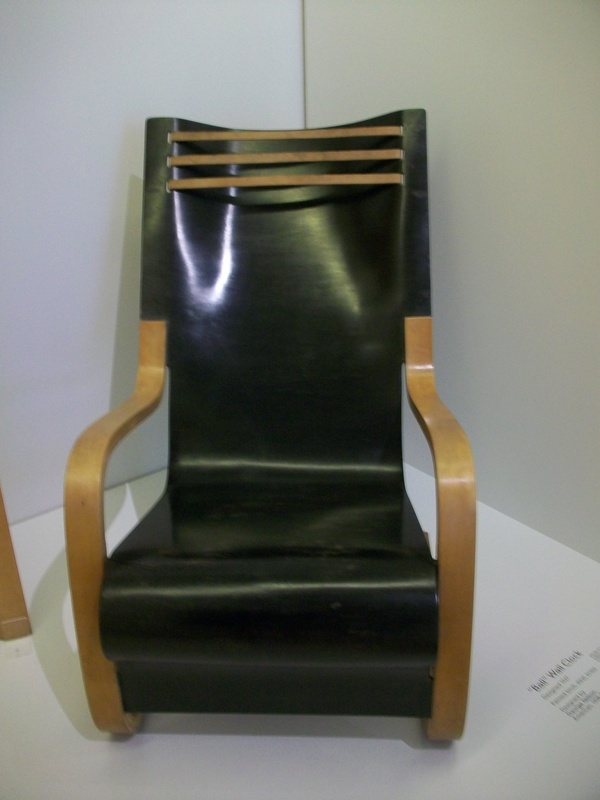 Furniture of Alvar Aalto, for example Armchair Model No. 31 (picture below), ‘Kilta’ Tableware from Kaj Franck, and a pitcher, glasses and basket combo from Saara Hopea (in the picture above).